This product was added to our database on Friday 20 february 2015. 1. Fairey Gannet AS.4 UA+108, Nr. 1 Squadron MFG 2, Federal German Navy (Bundesmarine), Westerland, Sylt, 1964. Extra Dark Sea Grey and Sky finish. Propeller spinners painted black. Serials, codes and lettering in black. MFG 2 shield painted on both outer finlets. Bundeswehr insignia in all six positions. 2. 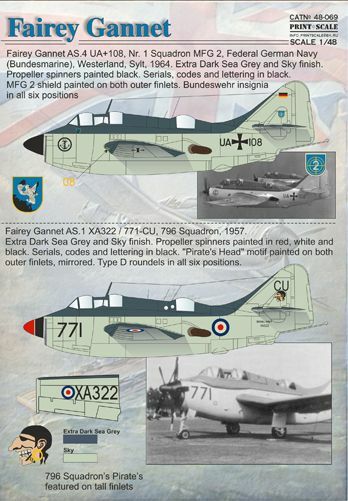 Fairey Gannet AS.1 XA322 / 771-CU, 796 Squadron, 1957. Extra Dark Sea Grey and Sky finish. Propeller spinners painted in red, white and black. Serials, codes and lettering in black. "Pirate's Head" motif painted on both outer finlets, mirrored. Type D roundels in all six positions.